The Fuggles IPA is not your father's IPA. I'd classify it as a more a Heffewizen as it has a lighter summery feel. There is a bitter wheatish taste and the end of the sip. The opening sip is dominated by a fruity flavor that leads into a hop tardiness that struggles to overpower the fruitiness and ultimately fails. This is the perfect IPA for a person who doesn't want an IPA, but wants to look cool by ordering an IPA. The ABV on the Fuggles IPA is 5.8%, not too shabby. This isn't an IPA I'd order if I were looking for an IPA, but I could see the benefits of drinking this on a nice summer afternoon. The rating is 2.5. I'm going to go on record and disagree with this review. 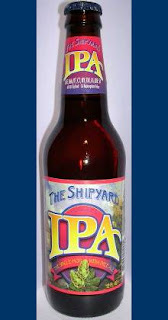 Shipyard makes a very nice IPA. I'm thinking that it is possible that you had an "off bottle" or something. I'm recommending a re-taste. Also, if you are ever in Portland, ME, Shipyard's brewery is close to the waterfront area and gives excellent tours. Highly recommended. Lastly, avoid Shipyard's Bluefin Stout. I can't figure out what they were trying with that one, but it is not positive. This is disappointing, just a little bit, only for the fact that it suggests that people have been disagreeing with me this entire time "off the record". Oh well.